15 things about the past 15 days. 2014 is already 1/24th over and I’ve not done a thing around here, not that I haven’t wanted to — I’ve just been busy keeping other people alive. Tiring work, keeping other people alive. But I feel as though I need to give you a brief update, as well as document things for myself because if 2014 goes as fast as 2013 I’m going to look into suspended animation because, whoa, slow down. 2. I cried at the bottom of some stairs on Monday night because the elevator was broken, it was 11 pm and Vivi was fast asleep in her stroller. It wasn’t the true emotional pressure release I really needed, but it was a start. Woe be unto the people who are around when my true meltdown occurs. 3. Oh, by the way, we were in Florida all last week. We covered Universal Orlando, Disney World and the Walt Disney World marathon. We took off last Saturday because we knew the weather was going to get dicey and we just got back at 8 am this morning. Yes, we drove. Yes, 16 hours is a long way but it was totally worth it. 4. Despite being gone for 12 days, Addie only missed two days of school because school was cancelled ALL OF LAST WEEK. Meaning had we not gone I would have been stuck in the house with these little girls for ANOTHER week (after Christmas break) with polar temperatures outside. WE BASICALLY RULE ON VACATION TIMING. 5. Cody ended up getting vertigo on Monday (brought on by a double ear infection and sinus infection) and he was easily the most sick I’ve ever seen him in our entire marriage. He was rendered completely incapacitated for at least 4 days, and is still recovering from the spins. 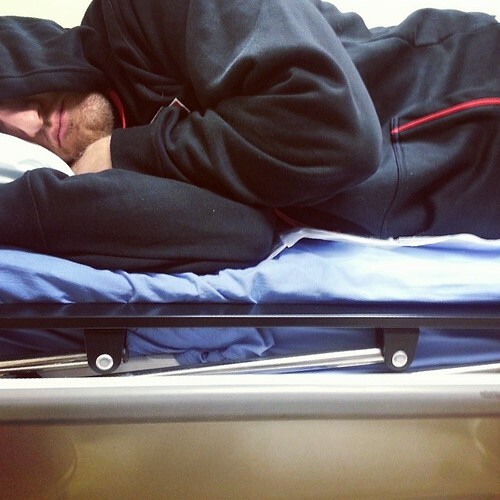 He’s also recovering from running a marathon on Sunday, six days after he was released from the ER. 6. Poor Cody, yes? Also, perhaps you remember that the last time we went on vacation together I got pneumonia. At least on that trip we didn’t have the little girls with us, I was a very primary caregiver for the majority of our trip last week which is part of the reason I cried at the bottom of the stairs and over a biscuit. 7. Regardless! We had fun. So much fun. 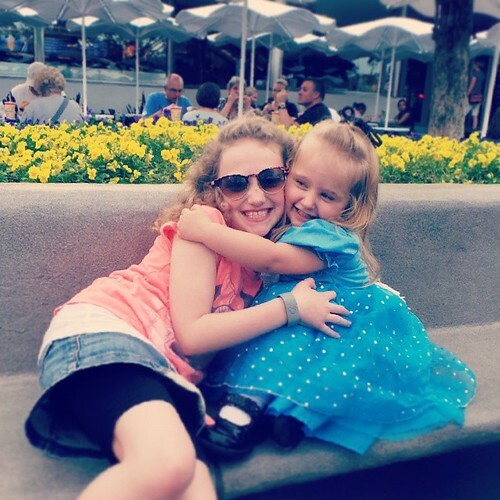 Those two little girls together surrounded by Disney magic was just that, magical. 8. Our hotel room at Disney’s Animal Kingdom Lodge had bunk beds for the girls. Despite our best efforts to wedge Vivi in, she still managed to fall out of bed at least five times. 9. Vivi is addicted to roller coasters. She went on Flight of the Hippogriff at Universal Orlando six times in a row, and the only reason we stopped at 6 was because I was *thisclose* to passing out. 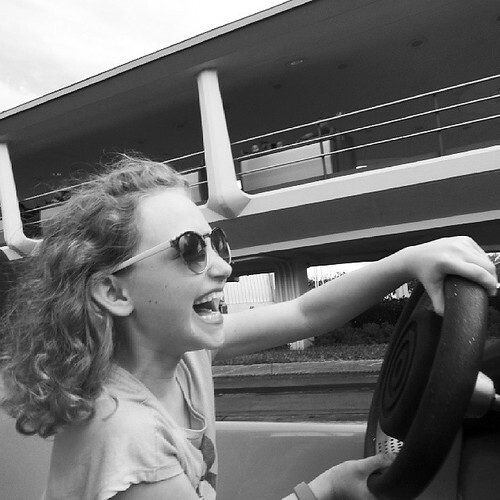 At Magic Kingdom she rode Goofy’s Barnstormer 10 times over the course of three days. She giggled like crazy every time. Addie on the other hand, she’s always cried on roller coasters and still does. 10. We have something in our family called “Mickey Sandwich O’clock.” It started with Addie when we took her to Disney World for the first time in 2008. You know that point in a very busy day when everyone is DONE and tears are all over the place and there’s maybe a little screaming? That’s when we seek out Mickey-shaped ice cream sandwiches and chill. Works every time. 11. Wink missed us. He held hands with Cody and me as we took a well deserved recovery nap today. I’m fully expecting a face full of cat tonight. 12. Cody refused to wear his marathon medal out in public — because despite him finishing a marathon after being so sick, his medal was third tier in the assortment of available runDisney medals. You see, people had the option of completing both the half and full marathon and receiving a special “Goofy Challenge” medal. There was also a “Dopey Challenge” medal for people who completed the 5K, 10K, half and full marathons over the weekend. In protest to not winning all the medals, he’s already got his eyes on the “Double Dumbo” and “Coast to Coast Challenge” medals in Disneyland. THEN he can walk around with all his medals and not feel the least bit inferior. 13. Addie is quite possibly the best kid to ever exist. I mean, ignore the incessant questions, the refusal to comb her hair and the fact that she can’t keep her room clean for more than an hour — the kid is just spectacular. I could have never survived last week with Vivi without her. 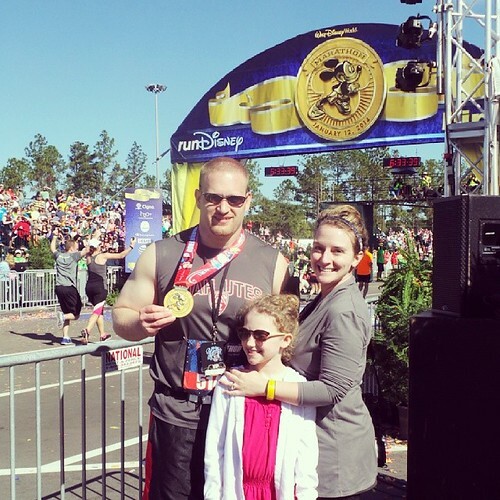 She also managed to run a 9:06 mile in her “Mickey Mile” race, Cody is boastfully proud of that little girl. 14. Totally unrelated to last week, I’m amazed at how many people were pregnant at the same time as me or after me in 2011 and already have another baby, or are pregnant for a second time. I cannot even fathom either, I am barely holding myself together with two six-years apart — even friends who swore they were done with 2 are onto 3, 4 or even 5. I am not that lady and God knew *exactly* what He was doing when He gave me the two He gave me when He gave them to me. 15. Last week I received an unexpected email that informed me that my best is moving to Belgium by fall of this year. I’m not really okay with it but I don’t really have a choice. All I do have is a current passport and a broken heart, she was my first real friend I made in Indiana, she’s who made Indiana home to me. Sure she’ll be back and I’m sure time will fly and we have the Internet and blah blah blah, but Indiana will never ever be the same without her. past mistakes, present miracles, pretty dorks. I had kid #1 in Nov 2011 and kid #2 in April 2013. But that is perfect for our family – to each his own. @Jackie, You are a stronger woman than I am. So this one time when we were traveling in Bulgaria, I wanted breakfast. They had these lovely looking baked goods. They looked a little like danishes. When I took a bite, I realized it was more like salty feta cheese than sweet cream cheese. As we were crossing the street at the moment, I dropped the damn thing and burst into tears. Brandon didn’t understand why because I didn’t like it anyway. I just wanted breakfast. That’s all. @Anna, Oh man, I could write an entire history of dumb things I’ve cried over. “Mickey Sandwich O’clock” is genius! It’s like my Dole-Whip-OClock but sadly that only works when we’re in MK so yes, we’re big fans of Mickey sandwich time too! I just like your name better! Welcome home! Oh, how I’ve missed you! I can’t blame you at all for the crying, or the collapsing. I’m so glad that God not only blessed you with Cody, but with those two girls, who can, with a smile and a hug, make it mostly all better! So glad you made it home. @Christy Cruz, Oh thank you. I’ve missed being around, online, in real life, everywhere really. Tell Cody that he should have worn his medal proudly. I was at the parks on Sunday during and after the marathons and everyone wearing a medal,regardless of race or races earned in, was congratulated by every Disney employee they encountered. No pointing out what they earned the medal for, if they had a medal on, they got a simple “congrats” from the park employees. @Casey, well next time you guys are in town, let’s try to all get together for lunch or something! It was just my girls and me as well, sick wife at home, but we were at Magic Kingdom just for the UCF parade and then at Hollywood Studios. I’ve loved seeing all your Orlando pictures! Although you drove to Orlando, can you update on me on whether Vivi is better at flying yet? Please give me some hope that things get better!!! We went to WDW in September with my then-18 month old. Worst experience of my life. She is the WORST at flying. She was also CRAZY the entire time we were there (not wanting to stay in her high chair or stroller), and we were miserable. Our four year old, on the other hand, had an amazing time and went on all the “big” rollercoasters about 5 times. @Stephanie, I haven’t flow with her since the big terrible time last year. BUT I’m almost certain she’d be better because A) she’d have her own seat B) she can be reasoned with (I mean, a little bit) and C) she can entertain herself MUCH better now. And despite having four children under 6, there being only 3 years between #2 and #4 (yikes), my heart is still crying out for a #5. My head, body, and husband are all screaming “NO!! !” but my heart isn’t listening. Your girls are so sweet together. @Erin Marie, Oh, there have been times I haven’t even let Cody get me something because I know he’ll just get it wrong and I’ll SOB AND SOB. I totally knew Vivi was out there waiting for us, but now that I’m not hearing any little voices I’m happy with where I’m at. Believe me, if I were still hearing them or feeling them it would be much different. I cried yesterday because the elevator was taking too long and I thought I was going to miss my train. Granted it was an extremely challenging day, but man I’m glad I’m not alone in sudden unexpected outbursts of tears. I cannot tell you how much I’ve loved seeing your Disney pics, I think I showed them all to my husband. I’ve decided that Vivi and Bella are destined to be BFFs in their princess dresses. @Marta, What’s funny is Vivi is the least princess princess out there, she wore them and said “I’M A PRINCESS! ?” But it never sunk in. She’s a funny one, that Vivi. That last one? #15? That,all by itself, would be the reason I’d be crying for no obviously real reason. My best pal moves away and I’d be a complete train wreck. No wonder you’re not really fine with it!! @Jill, I’ve already looked into flights and am saving up $1,200. As soon as I do? Belgium HERE I COME. I love your pictures of your girls. They make me smile. EVERY. SINGLE. TIME! Firstly, your biscuit is my blanket. Only instead of crying, I defend it viciously, with much yelling and many threatenings. A bazillion other couch blankets, and all four of them always try to steal MINE. IT’S MINE, I TELL YOU!!! Secondly, there is a fighting chance that we will end up stationed in Belgium starting summer 2015. Keep saving, it could be a two-fer!